WASHINGTON CITY — A man was transported to Dixie Regional Medical Center Thursday night after he crashed his vehicle and the car caught fire in the Treasure Valley subdivision in Washington City. Just after 7 p.m., a man was driving a passenger car in the Treasure Valley subdivision, located at 3990 S. 20 East in Washington City, when he crashed into a tree after possibly suffering a medical episode, Washington City Fire Chief Brent Hafen said. The man’s foot remained on the gas after his vehicle hit the tree, which caused the back wheels of the car to catch fire. The vehicle then became fully engulfed in flames, Hafen said. 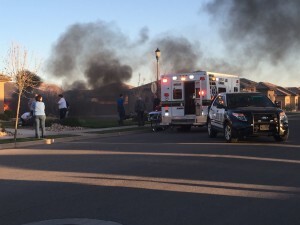 Passerby Judy Baker said she saw the smoke and fire as she was leaving the subdivision and called 911. A Washington City Police officer who was the first emergency responder to arrive at the scene pulled the man out of the burning vehicle. The man was disoriented, Hafen said, and was attended to by medical personnel at the scene before being transported by Gold Cross Ambulance to the hospital. Hafen said he did not know the nature of the man’s injuries or what type of medical episode may have triggered the crash. Washington City Fire Department responders put the fire out but were unable to save the vehicle. The Washington City Fire Department, Washington City Police Department and Gold Cross Ambulance attended to the scene.